the thyroid iodide transporter SGLT5. from. 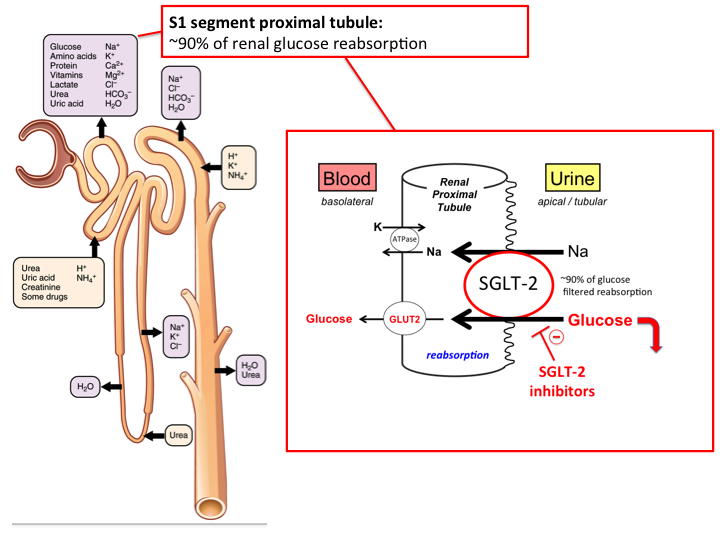 Metabolic control of kidney function II. Partial oxygen pressure (pO2) is lower in renal medulla than cortex, exposing the medulla to a greater risk for hypoxic damage. A concept is proposed that integrates the actions of extracellular adenosine (ADO) in the different regions of the kidney with respect to a protection of the medulla from hypoxic damage. The line plots illustrate the relationships between the given parameters. Small circles on these lines indicate ambient physiological conditions. 1, A rise in GFR increases the Na load (FNa) to the tubular system in cortex and medulla. This increases the salt concentration sensed by the macula densa ([Na-Cl-K]MD)(2), which enhances local ADO (3). 4, ADO lowers GFR and thus FNa, which closes a negative-feedback circle providing a basis for an oscillating system. 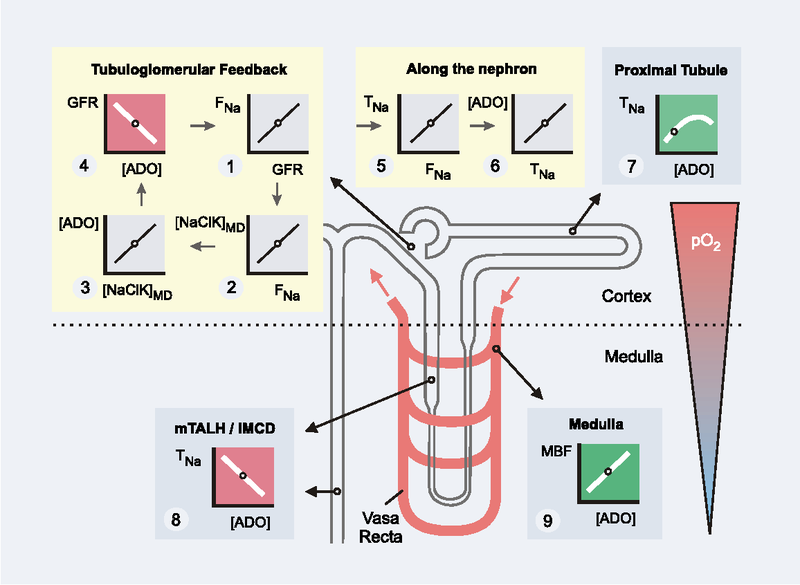 5, FNa determines Na transport work (TNa) and O2 consumption in every nephron segment, and thus oscillations in FNa may help protect the medulla. 6, A rise in TNa increases ADO along the nephron. 7, In the cortical proximal tubule, ADO stimulates TNa and thus lowers the Na load to segments residing in the medulla. 8, In contrast, ADO inhibits transport work in the medulla including medullary thick ascending limb (mTAL) and inner medullary collecting duct (IMCD). 9, In addition, ADO enhances medullary blood flow (MBF), which increases O2 delivery and further limits O2 consuming transport in the medulla.